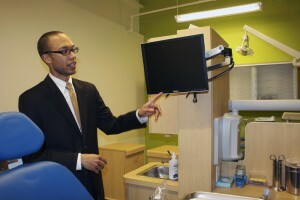 Dentist Steven Myles shows how he is able to access a patient's medical records during appointments in Bread for the City's new dental clinic. It’s been more than a decade since Florence Sandridge has been to a dentist. Now, the 80-year-old needs a plate put in her mouth. “Usually the dentist is so expensive,” she said. That’s why last week she went to the ribbon-cutting of a free dental clinic for low-income D.C. residents. The Bread for the City single-room clinic — with its green walls, new equipment and a couple of dentist chairs — fills a big gap. There are few options for low-income D.C. residents. Those on Medicare, Medicaid or signed up with D.C. Health Alliance receive some dental coverage. There are also a few other free dental clinics in the city — such as one run by nonprofit So Others Might Eat — and a mobile dental clinic that makes stops throughout the city. “But there just aren’t enough services,” said Kristin Valentine, Bread for the City’s development director. Dental care is consistently the most requested service among the Bread for the City’s clients. Even those with dental coverage don’t regularly see a dentist; about half of low-income adults with coverage haven’t been to the dentist in at least a year, according to a Kaiser Family Foundation report. The reasons vary. Some have problems finding dentists who accept Medicaid. Out-of-pocket costs for those under private and public plans may be too expensive for families. Other issues keep low-income adults from getting dental care, such as lack of transportation, child care and work arrangements and cultural barriers, according to the Kaiser report. Joan Carson, 56, is a Bread for the City client who serves on the nonprofit’s advisory board. She said it’s difficult to find dentists who accept Medicare and Medicaid. Another advisory board member and client, 54-year-old Deborah Branch, said she was thankful for the clinic, which has been a long time coming.